Express Router Tutorial Example From Scratch is today’s leading topic. Routing refers to how an application’s endpoints (URIs) respond to client requests. Express is the popular Node.js web framework. Amongst its functionality as it provides a wrapper for Routing. The Express Router class helps in the creation of route handlers. Express apps utilize routers that are essentially containers for a set of middleware. We can put this middleware holder only on a specific route, which allows us to keep our logic in separate files and bring them together on our terms. 2 #1: Create an express project. 3 #2: Let us write the first express route. First of all, we will create a project for the express router example tutorial. #1: Create an express project. Create one project folder and go inside that folder. Now, install the express using the following command. #2: Let us write the first express route. Now, inside the root folder. Create one file called server.js and add the following code. First, we have imported all the required modules and then create an object of a router and then defined on the root route. Then we have used the middleware saying that, if any request comes with the ‘/api’ then it will call the router function with its route. So in our case, we will get a JSON response. So this was the example of basic routing that we used to do when we create a web application with express on Node.js platform. Express supports the main following routing methods. There are still other methods, but mainly we used the above methods in a web application. There is a routing method called app.all() which is not derived from any HTTP method. The routing method gets loaded for functions at a specified path for all of the request methods. The route path is used to define an endpoint where requests can be made. It is like a backend endpoint. In the Express, route paths can be string patterns or regular expressions. In the above example, the route path is the below. The route parameters are used to capture the values that are specified to a particular position in the URL. They are called the URL segments. The values obtained are made available in a req.params object, using the name of the route parameter specified in the path as the keys of the values. Route parameter is significant in functionality like edit, update, and delete. We generally pass the ID on the parameter and extract from the request. The syntax is like this. Now, at Express Router, we can access the ID using the following code. So, we can access the 1 using the following code. The basic syntax of express post route is the following. Inside the router post method, we save the data that come from req and extract that data from req and save the data inside the database. Just like the following code. So, here we have used the Mongoose model to save the data in the MongoDB database. It is just a real-time example that will show you how you can create your post request and save the data in the database. 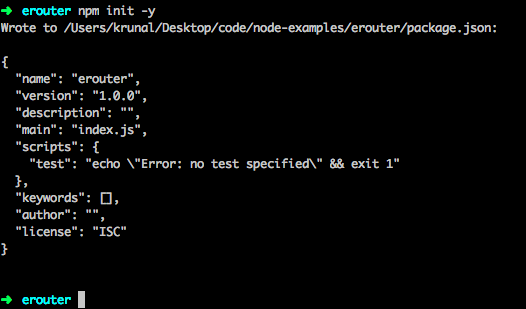 Finally, Express Router Tutorial Example From Scratch is over.